Learn the latest techniques and about the business of a professional make-up artist. Practical and theory instruction covered in this course. Receive one-day quality Elleebana Lash Lift training with the fastest Lash Lift in the world! Add this high-margin treatment to your service menu. The student develops an understanding of all aspects of manicure and pedicure techniques. Practical and theory instruction covered in this course. Students will study different methods of hair removal, disinfection and sanitation, and waxing contraindications. Includes techniques for both facial and body. Receive one-day quality Elleebana Brow Henna training on the next generation of eyebrow tinting. This program has designated hours in practical and theory. 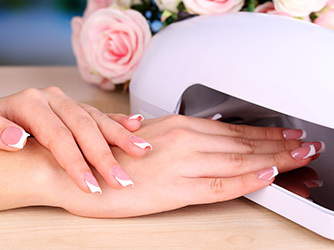 Students will learn all techniques to create beautiful gel nails. Includes techniques for repairs and mends.